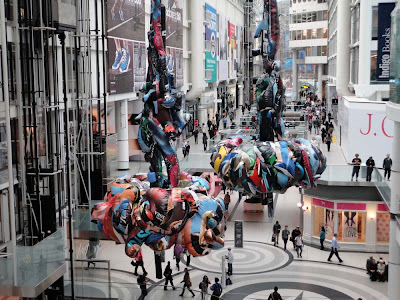 Sleepless in #Toronto is the way to go when you are hitting the @sbNuitBlancheTO all-night trail of contemporary art this Saturday. However, on the days leading up to the September 29, 2012 sunset to sunrise event is the time to get some extra rest so your energy levels are high for the long night of art appreciation. You can also use the time to go through the guide picking some of the 150 projects that you want to visit. You will really need to be sharp to make it through the massive crowds, the art installations that are liberally sprinkled throughout the city and the transportation issues that come with discovering the works. 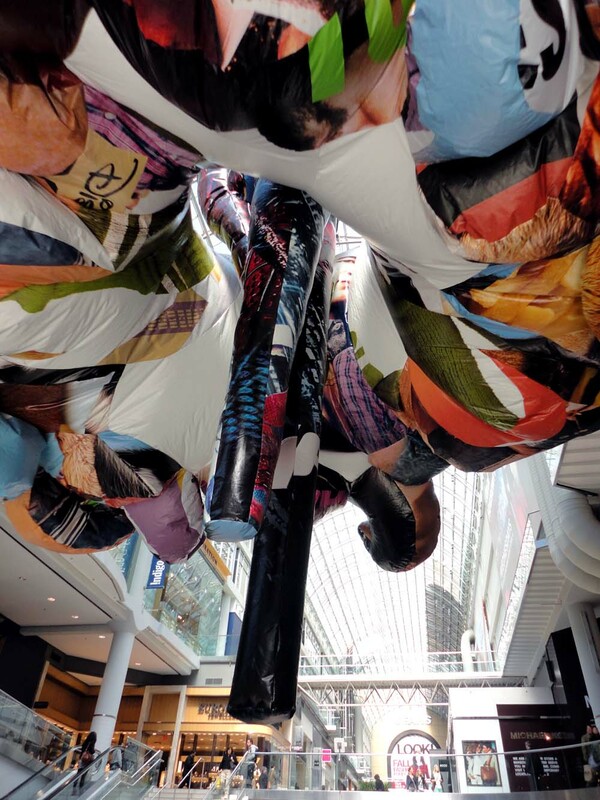 In the Eaton Centre you can get a sneak peek of one of the Nuit Blanche installations as Vertical Constructions: Dancer #1 and #2, 2012 is going up right now. 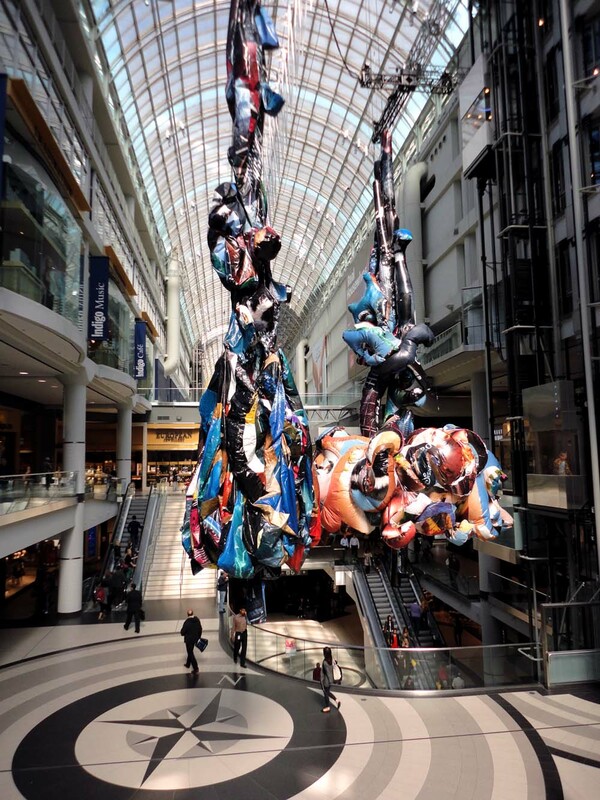 The work is by Max Steicher from Toronto and is pictured in this post, please note that one of the Dancers is in mid-inflation so you cannot experience the true rush of the hanging installation. 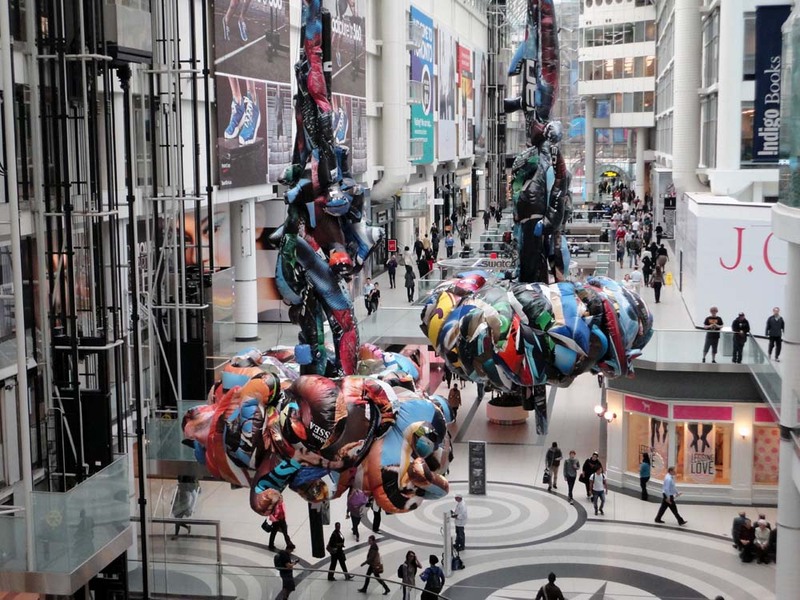 The individual three dimensional forms that fit together to make the piece were made from the giant advertisements that hang on the Eaton Centre Walls. The work really speaks to me and it reminds me of two multi-coloured Christmas trees hanging over the shopping mall's centre court fountain. Then it speaks to me of the coming winter and I notice the cold weather has already started as we enter fall officially. Then I remember that I hate the cold and then I start to dislike the art. Then I remember the Christmas tree and I feel warm thinking of presents and I like the art again. You might have different thoughts on the contemporary art because, as you can see, my tastes are very sophisticated. In fact I wish they had a beer installation that I could drink. 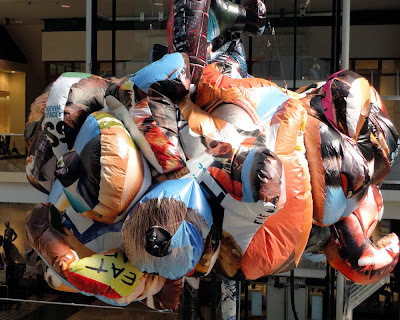 Sadly Les Rues Des Refuses will not have a renegade art program on for Nuit Blanche 2012 but the Rothko Institute will hold their Renegade Parade as part of the sanctioned Nuit Blanche events this year. 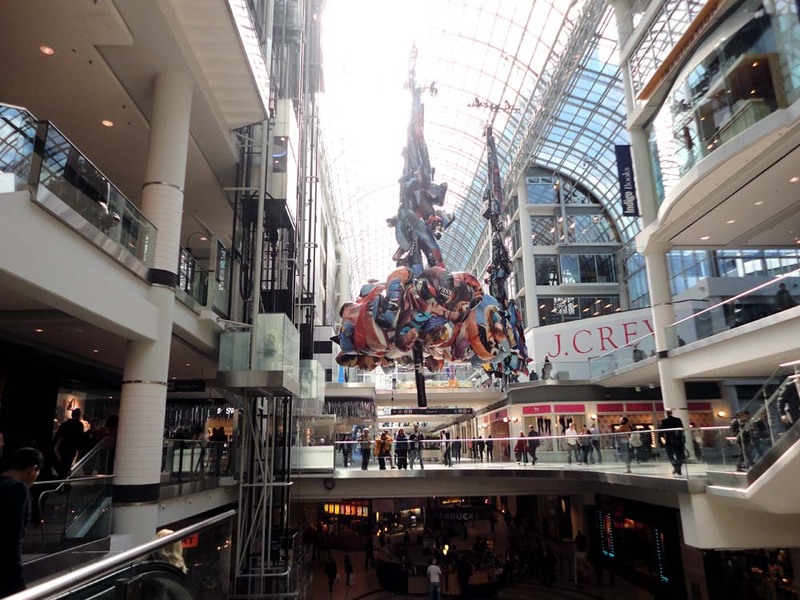 "The Parade will conquer the city, spreading music, chaos, and colour to the unsuspecting masses! It's an annual fantastical mission of mayhem that roams through the streets and spreads deep hard beats!!" They say that the parade will gather at the ROM Crystal and head out into the streets around 7pm. I hope that some of the underground events happen anyway - and that I run into them during the night. Update: Both of the hanging pieces have been inflated, ready for Saturday's event.